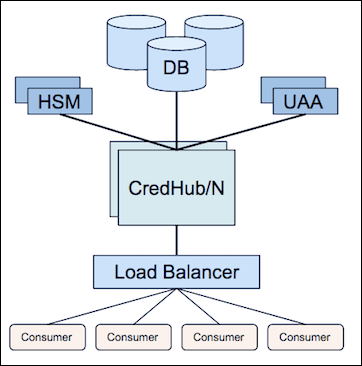 CredHub is a component designed for centralized credential management in Cloud Foundry (CF). It is a single component that can address several scenarios in the CF ecosystem. At the highest level, CredHub centralizes and secures credential generation, storage, lifecycle management, and access. CredHub performs a number of different functions to help generate and protect the credentials in your CF deployment. CredHub consists of a REST API and a CLI. The REST API conforms to the Config Server API spec. 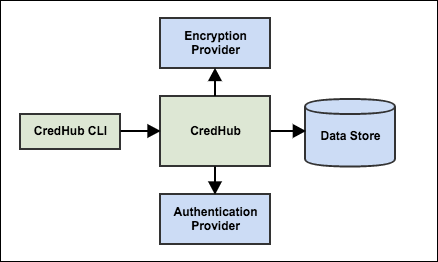 CredHub is an OAuth2 resource server that integrates with User Account Authentication (UAA) to provide core authentication and federation capabilities. 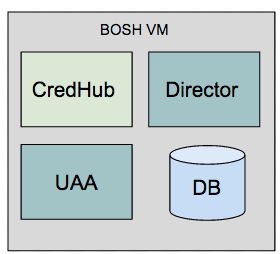 The two primary architectures for CredHub are either colocated on the BOSH Director VM or deployed and managed independently as a service. You can choose your method depending on the needs of your organization. You can deploy CredHub on the same VM as the BOSH Director. If you need a lightweight credential storage instance for the BOSH Director only, you may choose the colocated deployment. This configuration does not provide high availability. For more information, read Setting Up and Deploying CredHub with BOSH. You can deploy CredHub as an independent service on one or more VMs. If you need a highly available credential storage instance for multiple components in your deployment, you may choose to deploy CredHub as a service. CredHub is a stateless application, so you can scale it to multiple instances that share a common database cluster and encryption provider. Credentials exist in multiple places in the CF ecosystem. CF components use credentials to authenticate connections between components. CF installations often have hundreds of active credentials. Leaked credentials are common causes of data and security breaches, so managing them securely is very important. For more information, read CredHub Credential Types. The CredHub application does not hold state, but you must ensure its dependent components are backed up. Redundant backups can help prevent data loss if an individual component fails. For more information, read Backing Up and Restoring CredHub Instances.